Why guess about your brakes and put yourself or your precious family in danger? Come to Fisher’s Auto Service for a free brake repair inspection. Call us anytime at (425) 823-4441 to schedule an appointment. With so much riding on your brakes, doesn’t it make sense to take advantage of Fisher’s Auto Service’ free, no-obligation brake inspection? 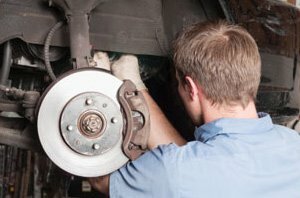 Set an appointment now for a brake repair inspection or any car maintenance service. Fisher’s Auto Service’ certified technicians provide expert brake service – including ABS brake repair – on cars, trucks and SUVs. Whether you own a domestic or foreign vehicle, Fisher’s Auto Service’ professional technicians understand how to treat your vehicle. The job will get done right the first time – with precision, speed, and just plain old hard work. After your free brake inspection, you’ll receive an easy-to-understand, detailed report. If your brake system is in good shape, you can leave with peace of mind. Should repairs be recommended, Fisher’s Auto Service offers affordable service for all types of brake jobs, including ABS brake repair. Since 1979, Kirkland, Wa drivers have trusted this locally-owned, family business with their brake work and other car services / car maintenance – and they keep coming back. Shouldn’t that say something to you? 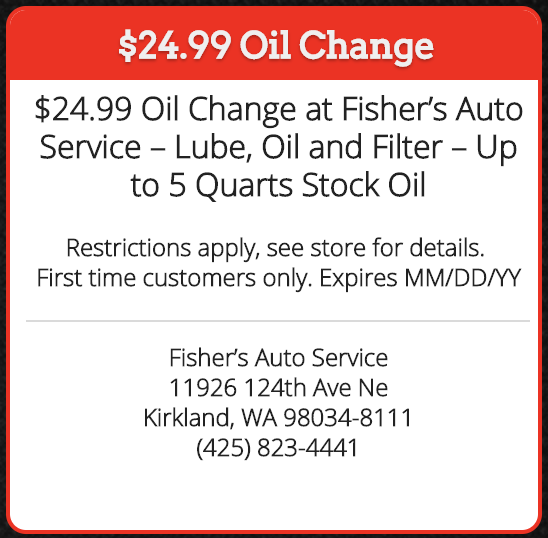 Save time and gas by getting your car services performed at Fisher’s Auto Service. With our convenient location at 11926 124th Ave Ne Kirkland, Wa 98034, you’ll find our repair center near your home or office. That makes it easier for you to get back home or work, and without the waste of gas. Keep in mind that Fisher’s Auto Service delivers a complete line of car maintenance and car services, including oil & lube, shocks and struts and wheel alignments. Ignoring your brakes can be a serious mistake. So, schedule an appointment at Fisher’s Auto Service for your free brake inspection today!